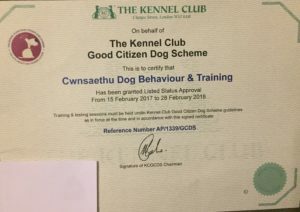 We are really pleased to announce that we have received Kennel Club listed status and are now able to offer The Kennel Club Good Citizen Dog Scheme puppy foundation, bronze, silver and gold awards. For more information on the scheme or to sign up to an awards course then please contact us. ← My dogs got a problem?